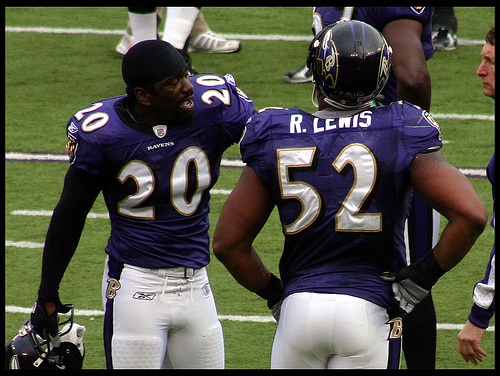 No doubt, we all here in Baltimore want to see Ray Lewis and Ed Reed leave the game on their terms. They have earned that right. Barry Sanders did it. Brett Favre did it, then did it again, and even did it a third time. What we would really like to see is these two men go out on top. Only a small group of men have been able to pull that off though. John Elway, Jerome Bettis and Michael Strahan come to mind. Unfortunately, many players end up becoming salary cap casualties towards the end of their careers. Jerry Rice, voted on this past year as the greatest NFL player of all time, was one of these guys. If the G.O.A.T. isn’t safe, who really is? All-time rushing leader Emmit Smith finished his career in Arizona. Peyton Manning’s large contract would have crippled the Colts if they hung on to him. Recently in Baltimore we’ve been through this with Todd Heap as he past his prime, and seen a real good player in Ben Grubbs go the way of a free agent. Just too many good players that are getting paid. Under a salary cap, you can’t fulfill them all. Ray Lewis is under contract through 2015 with a salary cap figure of 7.3 million next year. This year, Ed Reed’s cap figure is around 9.5 million and he is a free agent to be in 2013. You have to think if the Ravens are going to re-sign Reed, that the cap number would be about the same. He has always fought for a contract rewarding him for what he has done in the past. The Ravens will want to pay him what he will be worth currently. Ed Reed isn’t a 9.5 million dollar a year player anymore. The Ravens are currently only 1.2 million, give or take a few dollars, under that salary cap right now. No Lewis and no Reed next year would clear up 16.8 million dollars in cap space. That might be about as much as it would cost to franchise Flacco. If Joe Flacco gets the franchise tag, I would say these guys days are numbered. Theres not enough guys whose salary you can cut to make up for whatever the cap number for Flacco may be. If Flacco is offered a full on contract, Flacco’s number could be in the 10-12 million range. For Matt Schaub it’s 11.7 million. Matt Ryan, 12.99 million. A little more breathing room. If Ed Reed would be willing to take a smaller contract, he could be back. If Ray Rice was a flop, if Joe Flacco was a bust, if Terell Suggs wasn’t defensive player of the year, if Haloti Ngata wasn’t one of the best defensive tackles in the game, then paying to keep Ray Lewis and Ed Reed a part of this team wouldn’t be an issue. There would be no one else worthy enough to pay substantial money to. In house that is, excluding free agents. But has the time finally come? Are there too many holes on this team now that Ray Lewis and Ed Reed may have to call it quits, or play for a new team for the good of the Ravens? God, I threw up a little just typing that. Losing Ray Lewis and Ed Reed for the good of the team? It doesn’t sound right. Much like Colts fans had to come to grips with watching their franchise QB play in orange and navy blue, is this a reality the Ravens and their fans will have to face? It looks like it all depends on how the Ravens brass handles Joe Flacco. To franchise, or not to franchise? That is the question.